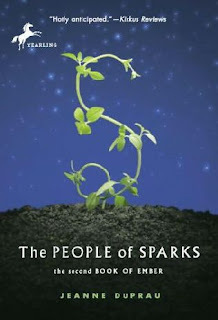 The People of Sparks picks up where The City of Ember leaves off. Lina and Doon have emerged from the underground city to the exciting new world above, and it isn’t long before they are followed by the other inhabitants of Ember. The Emberites soon come across a town where they are welcomed, fed, and given places to sleep. But the town’s resources are limited and it isn’t long before resentment begins to grow between the two groups. When anonymous acts of vandalism push them toward violence, it’s up to Lina and Doon to discover who’s behind the vandalism and why, before it’s too late. I enjoyed this book a lot more than I expected to. I found it by chance my last trip to the library and picked it up, wanting to find out how the people of Ember fare above ground. 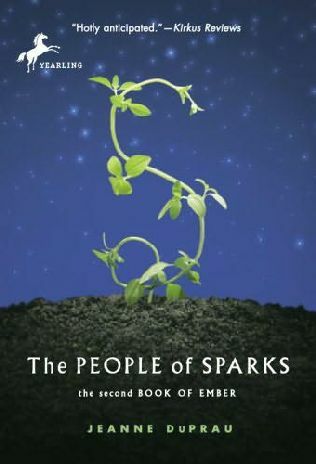 The City of Ember was good, but I thought The People of Sparks was even better. One thing I've really been attuned to lately is the message middle grade and YA authors send to their readers. Jeanne DuPrau sends a great, positive message to her readers, done in an age-appropriate, tasteful way. There are two more books in this series; however, this book does not have a cliffhanger ending like the first book did. If my library doesn't get the next two books, I think I'll be okay stopping with The People of Sparks. While I do enjoy this series, I'm just too old to buy middle grade books! Once I got past the fact that I am almost 30 years old reading middle grade fiction, I really enjoyed this one. As this is a middle grade book, I am scoring it against other middle grade books. A five star middle grade book is not equivalent to a five star adult book, just because I prefer reading YA and adult fiction. Holy smokes total score 24 out of 25! I know we have City of Ember somewhere in the house. I'll have to read that one before embarking on The People of Sparks. You're making my list grow every time I come back. Will jump on the The Hunger Game series for Sept. Can't wait. Thanks for the review, Kelli!